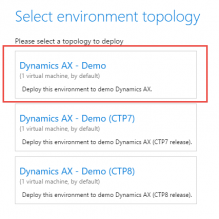 When you currently login to Lifecycle services you can deploy different versions of Microsoft Dynamics AX. You have to select the first option. The other two options are CTP7 and CTP8. Note that Lifecycle services requires a Customersource or Partnersource account to be authenticated. You can read how to enable a preview version to be downloaded/deployed in my blog from some weeks ago. At time of writing this blog post the downloadable virtual machine was not yet available. There is a link available on Lifecycle services, but the time I tested this it was referring to the CTP7 build. I think this will be fixed within short notice. So if you need to have the downloadable VM, check the Microsoft Connect site regularly. There are some nice enhancements in the user experience compared to the CTP8 version like the main menu and some improved features related to form personalizations. More information will be published/blogged soon.